One of the prime ways that we understand the geography of our planet is through recognizing the continental landmasses that populate it. And the 7-continent model that’s prevalently taught in English-speaking countries is the one that we’re going to primarily address, today. It’s not the only important lens through which we should see our world, but it helps to provide the foundation for a global understanding of how humanity is spread across Earth’s surface. And if a little bit of extra knowledge about the seven continents helps you to plan a dream vacation, complete a bucket list, or otherwise figure out where you’d be interested in traveling, that’s just icing on the cake, right? Asia, Africa, North America, South America, Europe, Australia, and Antarctica. I might even assume that the majority of our readers are familiar with each of these seven landmasses, and could easily point to every one of them on a map without requiring a second thought. A foundational understanding of Earth’s seven continents is essential for quite a few other aspects of global knowledge. Recognizing major landmarks wouldn’t be possible, without also recognizing the continental boundaries. Similarly, it would be difficult to name or locate any of the various countries throughout the world without first knowing which continent they reside on (if they reside on a continent, at all!) Even learning more about Earth’s oceans benefits from knowing which continents those oceans are bordering. And good luck learning about prevailing winds, weather patterns, or routes of global travel if you don’t know all of the seven continents! Below, we’re going to give you a crash course on all seven of them. We’ll talk about their relative sizes, their climates, their landscapes, and the people that populate them. We’ll even give shout-outs to a few well-known stereotypes, to either lend them credible credence or debunk them entirely! If you think you’ve already mastered the 7 continents, take our quiz below, but don’t cheat and look at the image above. Try to do it without looking and that way you’ll see if there’s anything you need to work on. Drag icons to their labels! The six-continent Americas model is largely the same, apart from the fact that it combines North and South America into a single continental entity. Similarly, the six-continent Eurasia model does the same thing with the continents of Europe and Asia. Many of the details that we’re going to be discussed below aren’t altered by a different understanding of how the world’s continents are separated, which is why different models continue to be taught in certain countries. Populations remain the same, countries’ borders are no different, and the landmarks and landscapes that can be found on these various landmasses aren’t in any way dependent on the lines that we’ve drawn to separate them. Unless, of course, we’re talking about plate tectonics—in which case, those boundaries can help us to read the planet’s geological and geographical history. As stated above, the seven-continent model is probably the one that you’re most familiar with. Below, we’ve organized the seven continents in a particular order—you’ll read about them relative to the size of their landmasses, starting from the largest, Asia, and ending with the smallest, Australia. We’ll give you a very brief crash-course on each of them so that you can take away some base understanding about the continents of Earth, as well as the people that live on them. In every sense, Asia is the largest continent on planet Earth. It has far and away the greatest landmass, and its heavily populated areas have the greatest population density. And the overall population? That’s the highest of the seven continents, too. But in spite of the wildly disparate and different cultures and demographics that make up this massive continent, it actually shares a few traits with smaller continents as well. Like many others, the most populated place are nearer to the borders of the continent, rather than in the center–which is mostly encompassed by the wilder interior. The coasts, then, see a great many heavily populated cities, with a population density that reflects the enormous number of people living here. Japan, China, Russia, Kazakhstan, India, Saudi Arabia, Iran, Mongolia, Indonesia, Pakistan, Turkey, South Korea, and dozens of other countries and territories can be found on the continent, and among the many isles included in its boundary. 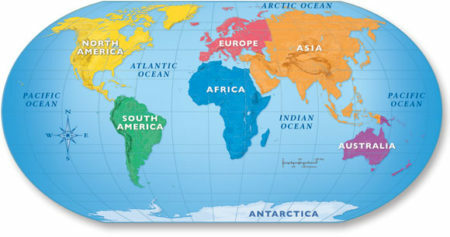 The continent has several different climates and is the home to many different countries and cultures. The majority of Russia resides in Asia, with only the more heavily-populated eastern parts of the country crossing over into Europe. China and Japan remain extremely powerful parts of the Asian continent. 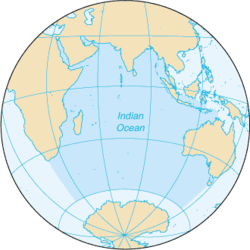 The landmass is bordered by the Indian, Pacific, and Arctic oceans. And Asia has prospered by all of the historic trade routes that this prominent sea access has allowed the continent. Along with Asia, Africa is the continent with the most swiftly increasing population. In the past century, it has surpassed Europe—which was once higher. 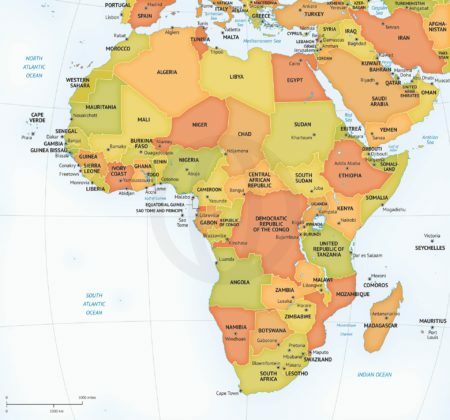 The continent includes dozens of countries with massive population centers, but tragically, it’s also a continent that has been crippled by war and strife. Historically, many cultures that sprang out of Africa are still thriving today, but war-torn borders and regular abuses of human rights make up a large amount of that history. Interestingly, most historians believe that Africa is where Homo Sapiens first evolved from our ancestors. While Europe might be the “birthplace of Western Civilization,” Africa is almost certainly the birthplace of all of humanity. As is probably obvious to our readers, there are three large countries that dominate the majority of North America—Canada, Mexico, and the United States of America. Though they’re far from the only countries on this continent, they make up a majority of its sizeable population. North America is also the third largest continent in terms of landmass. And amidst all of that landmass are 23 different countries, along with dozens of other territories and states. We’ve written about North America more extensively on 24/7 Continents, and you can read further in this article! Where North America is entirely within the northern and western hemispheres, South America is almost primarily within the western and southern hemispheres—thus representing the divide between these two continents. In contrast, the interior of South America is much more sparsely populated than its coasts. Through the interior runs one of the largest rivers in the world—the Amazon. It supports a remarkable ecosystem, one that’s unique in the world. However, even though the Amazon is perhaps one of the most renowned facets of South America’s landscape, the continent actually features many diverse biomes. The Andes are a prominent mountain range, and the Atacama desert is one of the driest places on the planet. It might have the smallest “population” overall, but Antarctica is not the smallest continent on Earth. In fact, its landmass encompasses more area than both Europe and Australia. Surprising, right? **As stated above, there is no permanent population in Antarctica. The continent does not have the means to sustain human life, and thus, anyone living on the continent only does so temporarily, and through the assistance of food and shelter that was brought to the continent. Make no mistake—it’s the cold of Antarctica that makes it so inhospitable. And it’s the fact that so much of it is covered by ice that means humans cannot live here permanently. There’s no place to raise livestock or grow crops, which are usually viewed as essential for groups of humans that want to live in a single region, without depending exclusively on imported goods to survive. However, that’s the situation in Antarctica, but it hasn’t stopped thousands of people from journeying to this continent every year, for sake of research and exploration. Though Europe is only larger than Australia, it’s the third most populated continent in the world. Surely, that gives you some ideas about the overall population density throughout the countries that comprise this region. While Africa might have been the cradle of mankind, Europe is most certainly the first and primary foothold of Western civilization in the world. The rise and fall of the Roman Empire was a landmark, setting precedents that contemporary cultures are still following. And the industrial revolution set the stage for manufacturing and production trends that we’re still dependent on, today. 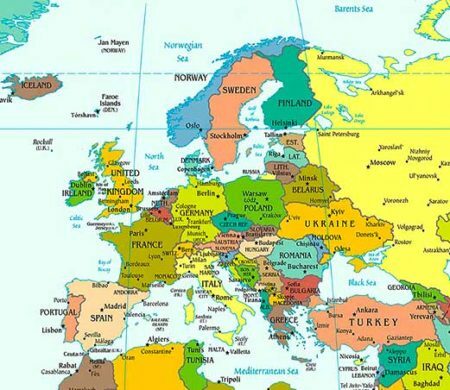 As you can see, Europe is far from the largest continent—it’s only bigger than Australia and Antarctica. However, the large amounts of fertile land—perfect for agriculture and livestock—have allowed population density to increase almost everywhere on the continent. Australia is another continent that we’ve written about at greater length on 24/7 Continents. It’s the smallest of the seven in terms of landmass, and only Antarctica is smaller in terms of overall population—an easy measurement, considering that Antarctica has no permanent population. None of this should fool you, however. Australia has an extremely strong economy, a highly-ranked quality of life for its citizens, and an immense amount of beautiful landscape that’s unique among the rest fo the world. Much of Australia’s interior is dominated by wilderness, and thus the most heavily populated areas are along the coasts. Similar to the human history of the Americas, this continent had a healthy indigenous population present for thousands of years before European immigrants ever set foot on Australian soil. Also similar is the ways that Aboriginal Indigenous Australians struggled in the face of colonial progress. Thankfully, Australia has made great strides towards reparations and recognition of these struggles, overall providing a stronger future for all of its citizens. The above information is only the very tip of the iceberg, so to speak. The barest information that you might want to know about each of the seven continental land masses on our planet. If you want to learn more about the seven continents, be sure to check out some of the links that we’ve peppered throughout this piece! Much of our writing on 24/7 Continents aims to bring you even more specific information about the continents and oceans of Earth. And if you ever have any questions, be sure to let us know in the comments, below! It’s no big surprise that a bunch of land-dwelling mammals (I’m talking about us, now) would be more focused on the continental landmasses that give us our sustenance. But what about the 5 oceans of the world, and the fact that they cover even more surface area of Earth than any amount of land? Or, that they feature climates, weather systems, and living things as diverse as any other part of the world? There are quite a few facts about the planet’s oceans that are overlooked by the majority, and it’s our minuscule mission to bring those to the forefront of your thought, in the following article. If you think you’ve already mastered the 5 oceans, take our quiz below, but don’t cheat and look at the image above. Try to do it without looking and that way you’ll see if there’s anything you need to work on. If you’ve been curious about Earth’s oceans (or even why you might not frequently hear of a fifth ocean) then read on! We’ve got a great combination of interesting facts, as well as recommendations for further reading both on-site and off! Even in modern human history, the same boundaries haven’t existed for all of Earth’s oceans. In fact, the most recently recognized of them only started appearing on maps within the past century! In spite of this, most maps now adhere to the same standards as one another, and thus, the oceans’ boundaries are universally recognized across the world. The history of our planet’s oceans is just as stories and eventful as that of its landmasses. They’re interconnected in the most intimate sense, and as tectonic plates have continued to shift and affect the placement of continents, so too have the oceans continued to change. Sea levels have risen and lowered. The oceans have frozen and thawed. Perhaps more than any stories that Earth’s inhabitants might tell, a more informative and interesting one is told by the planet’s oceans. In the same way that now-distant continents were once connected to one another (because of plate tectonics) so too were the boundaries of oceans entirely different from what we know them as, now. Speaking of the oceans’ boundaries, it’s helpful to recognize the ways that they’re connected to one another now, in our modern time. Whereas continental boundaries are usually drawn by notable landmarks, the lines that we draw around Earth’s oceans are a bit more malleable and less easy to discern, even when you’re looking right at a map. Ironically, the culprit for this difficulty is the fact that all of the planet’s oceans are connected, essentially forming one gigantic global ocean. Sure, there are topographical differences in the seabed that result in an entirely different landscape in those parts of Earth’s surface that are covered by water. But speaking specifically about those bodies of water that we recognize as oceans, they’re technically one, in spite of the fact that we’ve chosen to separate them. We’ve arranged our list of the planet’s oceans according to their relative size, starting with the largest and ending with the smallest. The largest of the bunch is, far and away, the Pacific Ocean. It covers the greatest amount of Earth’s surface and also has the greatest approximate volume by an incredibly wide margin. It’s the place of incredibly diverse aquatic ecosystems, and the Pacific’s warm waters play host to all manner of migrating species through various parts of the year. In fact, being the largest ocean also makes it the largest ecosystem on Earth. It’s also neatly bisected by the equator, meaning that there are different temperature and climates to be found depending on where you look in relation to that line. 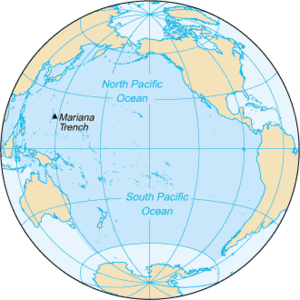 The North Pacific and South Pacific are frequently referenced independently of one another, not just for the sake of easier cartography, but because the Pacific is large enough to company a huge number of countries and territories. 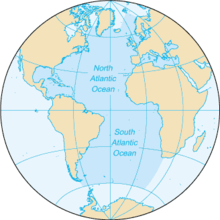 The Atlantic Ocean is the second largest on Earth, both in terms of the amount of surface that it covers, as well as its depth. It occupies the space between North America and South America, and continents to the east—Africa and Europe. The Atlantic also connects to each of the other four oceans and remains an immensely important waterway for a great deal of global trade and travel. Because it was a major route of passage for Western civilizations seeking to expand and colonize, and thus it was not only the first ocean to be crossed at its widest points by ships and planes, but remains one of those crossed most frequently. Also contributing to this is the fact that it isn’t as wide as the Pacific. More so than with any other of the world’s oceans, the Indian Ocean is renowned for its importance to early trade, overseas. It’s located between Asia, Australia, Europe, and Africa. It connects all of these continents directly, and along those borders, many trade routes were forged that are still utilized today. Many of the major exports from these connected regions—especially those utilized for industrialized society, like oil—take advantage of trade routes in the Indian Ocean. While the other oceans of the world have been recognized for hundreds of years (ever since people started navigating them, really) the Southern Ocean is a relatively recent designation by comparison. Only within the past 100 years has it been seen as an actual ocean with its own borders and boundaries, but now that they’ve been established, it’s definitely part of the model that we use to recognize all of Earth’s water bodies. And because it is, essentially, the circumference of Earth’s southern pole, it touches every other ocean apart from the Arctic Ocean. 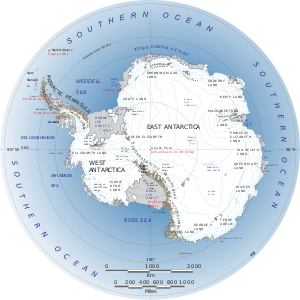 Also unsurprising is the territory that the Southern Ocean encompasses—primarily the waters surrounding the continent of Antarctica. This means that we’re looking at truly frigid waters, with a much more limited ecosystem than many of the world’s other oceans. Of course, this isn’t to say that they’re devoid of life; quite the opposite is true. But you won’t find bountiful amounts of life in the same way that you might in the Pacific, and colder waters automatically mean that fewer species are going to migrate through the region. Nevertheless, many of these qualities are the reason that the Southern Ocean is a recognized body of water in the first place—disparities are part of what made this necessary, and why you’ll now find it on almost all maps. 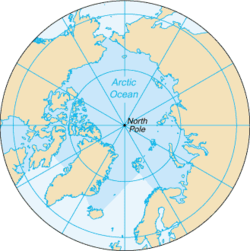 At the opposite end of the world is Earth’s northern pole, where one can find the Arctic Ocean. While it’s certainly smaller than the Southern Ocean—and the smallest of the five—it doesn’t have such a massive disparity in size between the Southern as both do with the much larger of Earth’s bodies of water. In addition to it being the smallest in terms of surface area covered, it’s also the shallowest of the five oceans. Frequently throughout the year, much of the Arctic Ocean is frozen over. Frigid temperatures ensure that it remains that way, and that has affected the reputation of the far northern territories of the continents that it borders—North America, Europe, and Asia. We’ve arranged the above oceans in terms of size—that was no accident—but we’ve abstained from talking about their actual sizes, throughout. That’s a little nugget of comparative information that we’ve been saving, and below, you can get a clear idea of how big the oceans are in relation to one another. Of course, these are all measurements of the surface area that the oceans cover; it doesn’t necessarily acknowledge their various depths, but even if we were to do that, the “size ranking” that we’ve achieved doesn’t change a bit. The Pacific Ocean still takes the cake, while the Arctic Ocean remains the smallest of the bunch. We hope that the above article has done its job, in introducing you to the five oceans of our planet. They’re each diverse in their qualities, regions, and histories both in relation to Earth and in relation to the people that have used those bodies of water for travel and trade, for hundreds of years. Each of them has a storied past, centuries of use by many different cultures, which amounts to the oceans being just as diverse and important as any landmass. Though we’ve written extensively about the continents of the world, absolutely check in with 24/7 Continents in the future to learn more about the planet’s oceans, seas, and waterways. And if you have any questions meanwhile, let us know in the comments below!